The night we were scheduled to leave for Baguio, Armi received text messages from concerned friends that it wouldn't be wise to go because of typhoon Hanna. I googled the typhoon's path and true enough, there's a simulation that it'll hit Baguio on the weekend, darn! With barely an hour before Joyce's flight landed, Armi and I decided to go Tagaytay. Thank God for Google, we at least found out how to go there. 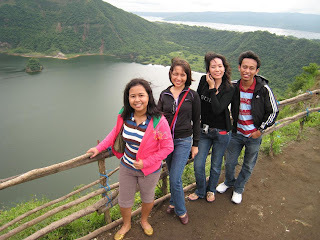 So we (Marlon, Joyce, Armi and I) hopped on a bus to Tagaytay the following morning. I had never thought that Marlon is very mareklamo, klaro kaayo napugos sya og uban, hehehehe (it's obvious he was forced to come with us). He kept on asking "Gia, mag-unsa man ta didto?" (Gia, what are we going to do in there?). And after I answered him, he'd grill me for more questions like "lingaw diay na sya?" (is it going to be fun? ), "after ana ,unsa next buhaton?" (after that, what are we going to do next?) I had to remind him a dozen times that Tagaytay was an impromptu decision and I wasn't familiar of the place so I didn't know yet what to do. I asked him not to worry, we'd know what to do when we get there. After assuring him that it'd be fun because everything would be spontaneous, the ingrate sent me a disgruntled look... killjoy! 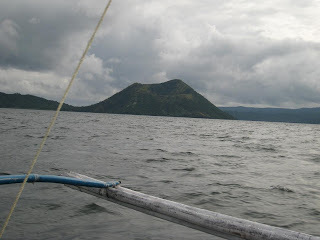 We went boating on Taal lake and horseback-riding to reach the crater. 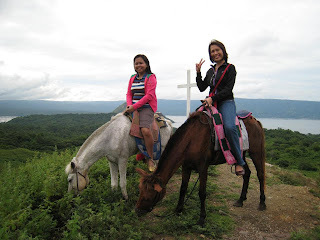 The experience of riding a horse while climbing steep trails leading to the crater was simply exhilarating. But reaching the crater wasn't the one I was proud of. It was returning unscathed to the starting line that made me want to pat my back. It's because going down the volcano on top of a horse, following trails that border along a cliff's edge no less, was more nerve-racking. Though there was a guide, it felt like it was just me and my horse, Christine, doing it all. When Christine galloped down the trail, I had to prevent myself from singing "I'm on the top of the world looking, down on creation and the only explanation I can find" :p Noticing Marlon also enjoying the experience, I had to prevent myself from sending him i-told-you-so looks. Don't believe the postcards, this is not the volcano. This is just a harmless mound with no crater! We reached the crater baby, yeah! And we remembered the Chemistry lab because of the awful Sulfur smell. Gusto ko ng mangabayo, hiyaa!!! We stayed that night at Royal Taal Inn and while each indulging a bottle of Smirnoff (except Joyce who preferred a Soy drink) mulled over Joyce's current situation. We also spent a lot of time discussing about Marlon - we girls simply couldn't understand why he doesn't seem to feel the need to engage in a romantic relationship with any human being. Well I think he's really just confused, suffering an identity crisis. Oh well he's a guy, he's got loads of time unlike us women haunted by our darn biological clocks... Grrr! The following morning we met up with another college classmate, Greg, who was so dear for volunteering to be our driver. He was a savior because we'd be basang-sisiw without him - it rained the whole day because of darn Hanna. Tagaytay was literally covered in fog, which gave it an eerie ambiance like the one in horror movies. Cool... hehe. With the five of us gathered, we reminisced about the past - like who had a crush on whom and what happened with this or that couple. We also talked about people who weren't there - like who's married, who's pregnant and who's now gay (haha!). Oh my, I can't believe it's already 7 years since we graduated. I'm glad that even after all these years we still have a bond, we still connect (last year we went to Boracay and yeah, a typhoon also followed us there - maybe this is a curse?). I am more delighted that Joyce and Greg who hid themselves after we graduated have come out and decided to honor us with their presence :p I hope more of these laag (trips) will happen soon and our plan of Euro tour on 2010 will come true.. naks!